Organizing my emails in Outlook is simple. Every client has a separate folder and I use the Outlook wizard to create rules so important emails don’t get caught in a spam filter or get neglected. This helps to keep my inbox free from clutter and more manageable. Friends and colleagues suggested that I create an excel database or create groups in my Gmail account. Unfortunately, both suggestions wouldn’t allow me to use tags to group contacts together. Plus, tracking conversations in excel is tedious. Fortunately, I came across Chris Brogan’s post on BatchBook.com and was floored with his review. The BatchBook features met all of my needs. I could organize contacts with tags, generate instant email lists, and track conversations instantly. My favorite features were the ability to add photos and create custom contact fields. Their plans were affordable too. In fact, I signed up for the Baby Blue account to test the waters. If I decide that I need to increase the amount of storage, users, contacts, or SuperTags – I can always upgrade later. In the end, BatchBook was the solution to my problem. 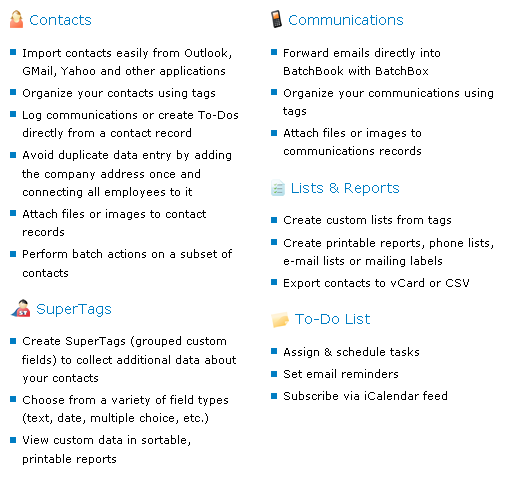 If you’re looking for a robust contact management application, I suggest you take a look at BatchBook. Below is a full breakout of features that they have to offer. Thanks for the wonderful writeup! From my perspective, it’s amazingly valuable to see what features are really resonating with users. Please let me know if I can help get you started with BatchBook in any way. Thanks for stopping by! I honestly thought I struck gold when I found BatchBook and have been sharing my new discovery with friends and colleagues. I also have to mention that your customer support team is amazing. I had trouble adding a website URL to one of my contacts last week and reached out to your support team. They answered my question right away and I was up and running in no time. Keep up the great work!